It might not seem that complex to the untrained eye, but door hardware such as interior door hinges can be as intricate and thought provoking as any painting in the Louvre. OK, that might be a bit of an exaggeration, but it is important for the handy do-it-yourselfer to realize that there is more than meets the eye when considering the hardware inside the common household door. In fact, believe it or not, there are about a dozen different types of hinges. Many retail and online stores that sell hardware offer spring loaded interior hinges, ball bearing hinges for interior and exterior doors, dummy hinges, decorative hinges, solid brass hinges, rustic hinges, strap hinges, door stops, double action hinges, flush bolts, handrail brackets and ball catches to their customers. With all of these to choose from, its obvious that hinges play a starring role in the performance of any door. Even so, its an item that can be overlooked and/or taken for granted. The reality is that pre-hung doors often are installed using commodity machine-strapped, brass-plated steel hinges. Although these usually work fine, it is well known that they tend to be engineered poorly. 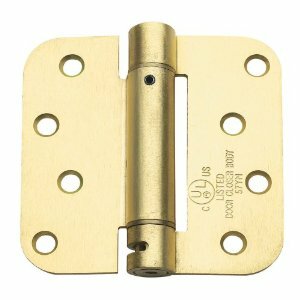 Search for solid brass stamped hinges. It is generally thought that the best hinges are the types that are extruded. The process by which these hinges are manufactured is more costly than other types of hinges, but it leads to a precision in the final product that is outstanding. One can be confident that these hinges will provide trouble-free performance for years. In order to accomplish the installation of the hinges, begin with assembling the proper tools and materials needed to perform said task. This will most likely include a folding ruler, a hand saw, screws, a wood chisel, sandpaper, a level, a screwdriver, a hammer, a hand drill, a mallet, a saber saw and a center punch. Next, its crucial to take accurate measurements of all the dimensions of the hinges and doors. Then, determine where the hinges are to be located. A door hinge typically rests 5 inches from the top and 10 inches from the bottom of a standard household door. Place the hinge on the door and mark the holes in the hinge on the door. After removing the hinge, drill a slightly smaller hole than the body of the hinges screw. Replace the hinge and tighten down the screws. Thats all it takes. Return From Door Hinges page back to prehung interior doors page. Return From Door Hinges page to Home - Finishcarpentryhelp.com.